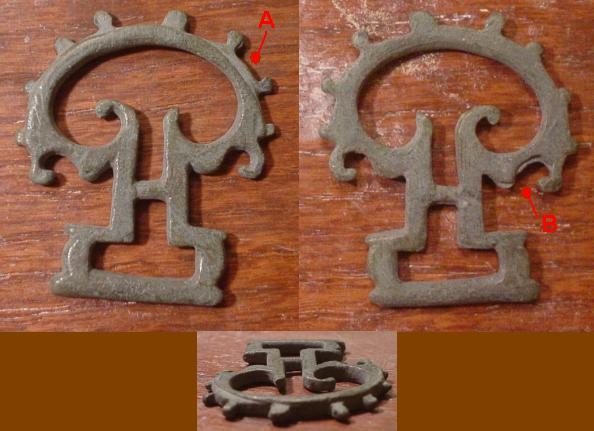 This is a copper-alloy roman buckle found in Britian. Of interest is that it appears to be cast in a 2 piece mould. You can see where the 2 halves were misaligned during production -- on the front top (A) and on the middle back right (B). Objects cast in stone moulds usually exhibit features that rise above the central plane, ie they are less "flat" than pieces fabricated from a sheet of wax or wood. Objects cast in stone moulds are often much rougher in texture. This piece is very smooth and very flat. With all these factors, I would conclude that this piece was cast in a 2 part clay mould. Of further interest is how the exterior curls of the pelta at "B" did not fill the mould fully.